When I went to buy the ingredients for this dish, I thought I grabbed a pork tenderloin off the shelf. That’s the cut of meat I always use with this marinade (as do my parents) and what I’ve used for this specific dish in the past. The marinade is one of my mom’s recipes…with the slightest twist. The original does not call for Sriracha, but I love the stuff and wanted to see how it would work with an extra spicy “punch.” It worked, alright. Delicious, spicy, and nutty. Absolute perfection. 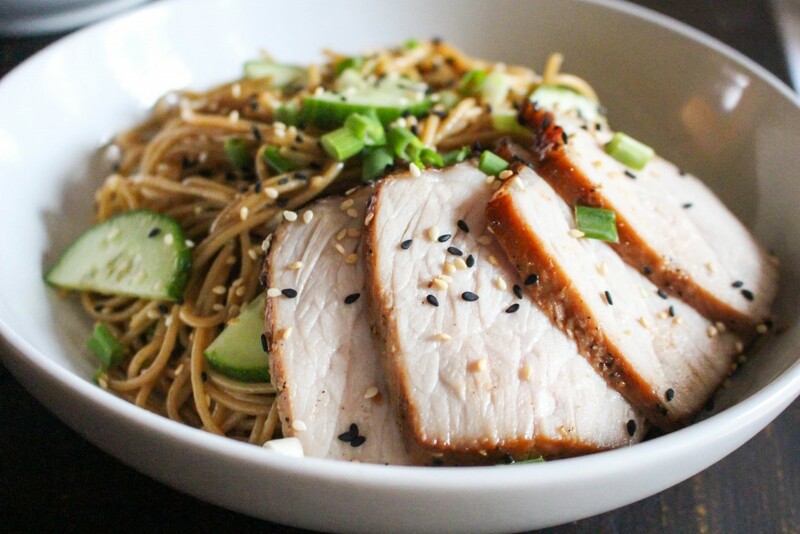 The marinated pork tenderloin I grew up with was reserved for special occasions. Along with my mom’s killer marinade for flank steak, it was up there in the rotation of family favs. And with good reason. It’s a cinch to throw together (most of the ingredients are probably in your pantry), and it yields a super flavorful cut of meat. Except if you buy the wrong type of meat. Hah. But I’m proof that even THAT isn’t really a wrong! See? Totally customizable. Combine the soy sauce, oil, sugar, vodka, sesame oil, hot sauce, scallions, garlic, and ginger in a large resealable bag. Add the pork, submerge in the marinade, and refrigerate for 6-8 hours. Remove the pork from the fridge and allow it to sit at room temperature for at least 15 minutes. Meanwhile, pour the marinade into a small saucepan and bring to a boil. Once boiling, reduce to a simmer, and allow to cook for 15-20 minutes. It should thicken and cook down slightly (this also makes it safe to use again). Preheat the oven to 450°F. Pat the pork dry with paper towels and place on a roasting rack in a shallow baking dish. Drizzle the pork lightly with canola oil and season with salt and pepper. Roast for 15 minutes (this will help the outside get a golden brown crust), then brush liberally with the boiled marinade, and reduce the oven temperature to 300°F. Roast for another 30 minutes, brushing with the marinade a couple times, or until the internal temperature reaches 135°F. Remove from oven, tent with tin foil, and allow the roast to rest for 10-15 minutes before slicing. The internal temperature of the roast should go up to around 140-145°F during this time. Thinly slice and keep warm (tent with foil) until you are ready to serve. 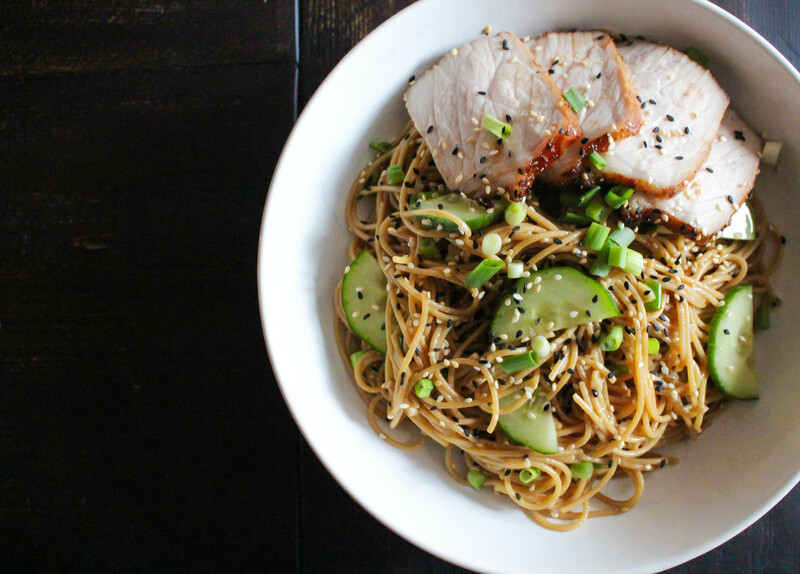 While the pork is roasting/resting, cook the noodles until el dente in salted boiling water. Drain completely and set aside. Once the pork is rested and sliced, heat the oil in a large skillet or wok and when hot, add the garlic. 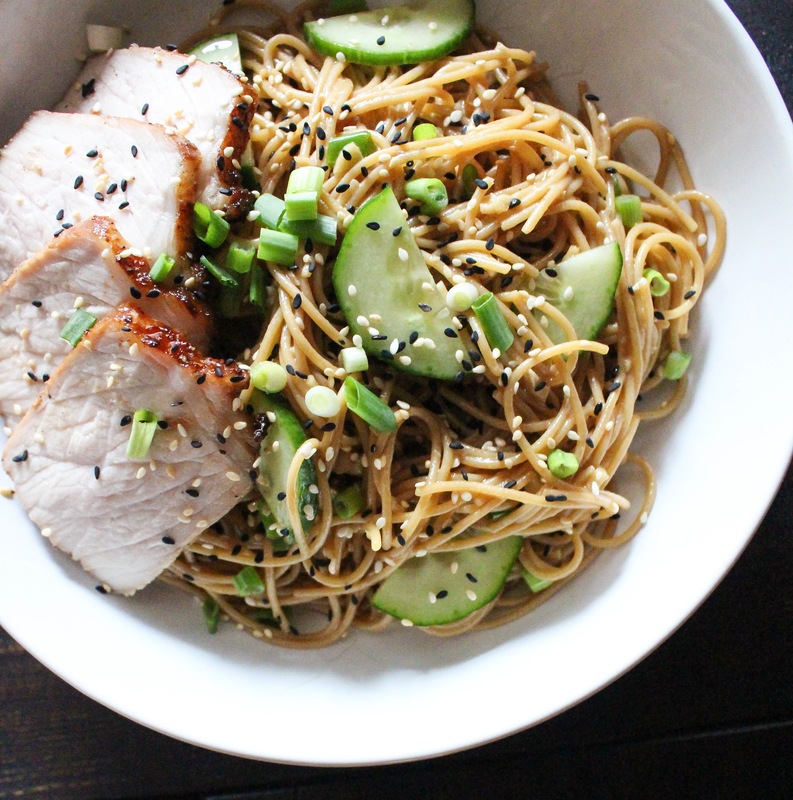 Cook for 30 seconds and then add the noodles, soy sauce, oyster sauce, and sugar. Stir-fry everything for 1 minute. Whisk the wasabi paste with a couple tablespoons of water in a small bowl. Remove the pan from the heat, add the wasabi mixture and a drizzle of sesame oil (add amounts that work for your taste – as I say above, we LOVE wasabi, so I really went for it). Add in the sliced cucumber and half of the scallions and sesame seeds. 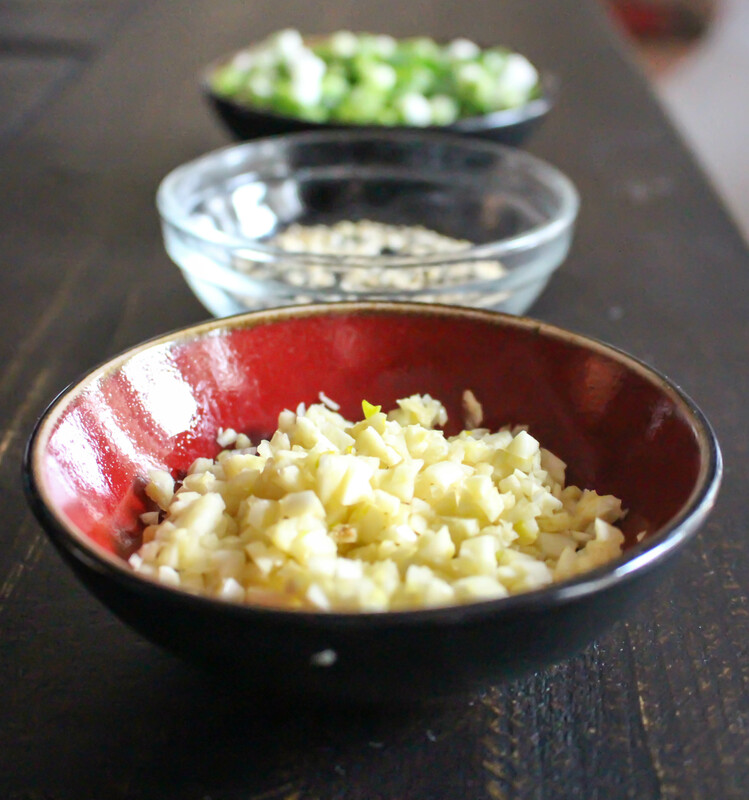 Toss the noodles to coat and taste for seasonings (adjust as needed). 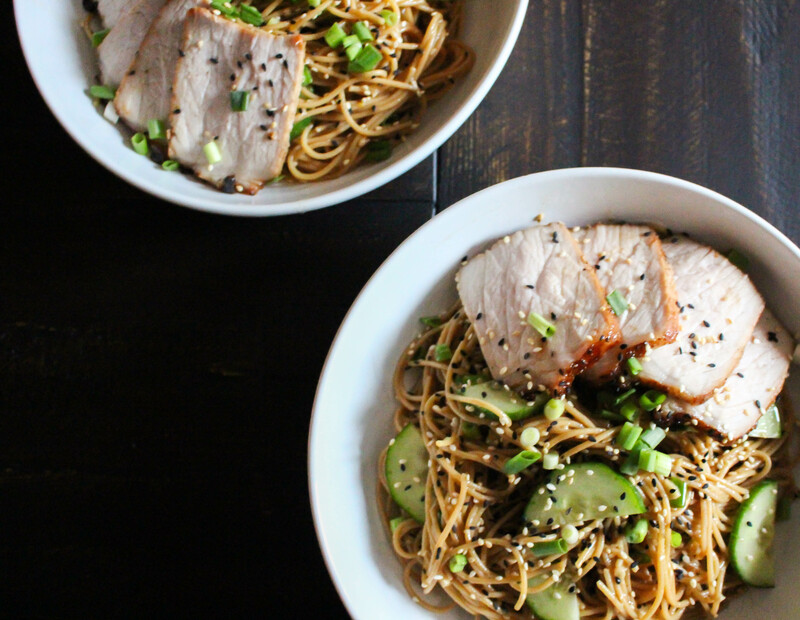 To serve, put the warm noodles in serving bowls, top with the thinly sliced pork, and then garnish everything with the remaining scallions and toasted sesame seeds. Serve immediately while warm. 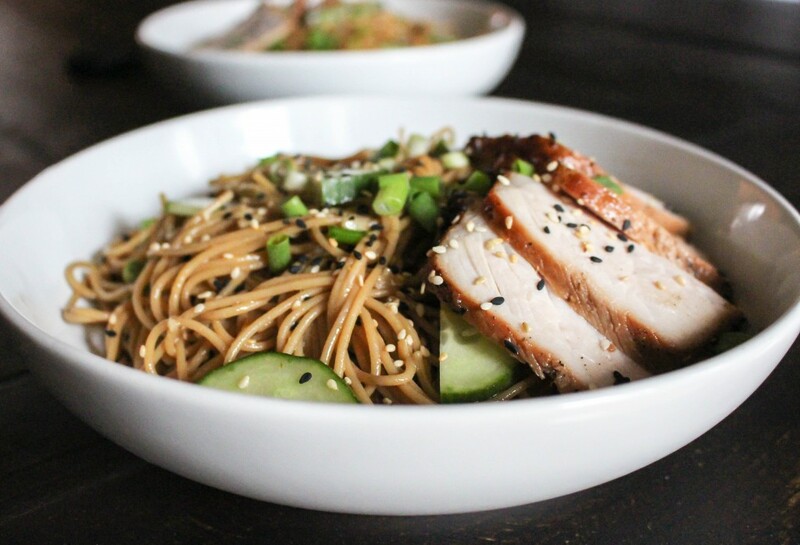 This looks absolutely delicious – thanks so much for sharing the recipe! beautiful pictures as always Molly – love this! Thank you, Shea! Let me know if you try it out. It’s sooo good. This recipe was great Molly! Me and my mom loved how all the flavors melded together. Thanks, Brittany! So glad you and your mom enjoyed it! Great recipe! My first time trying anything like this. Great instructions too! Hooray is right! I am so glad this worked out for you!